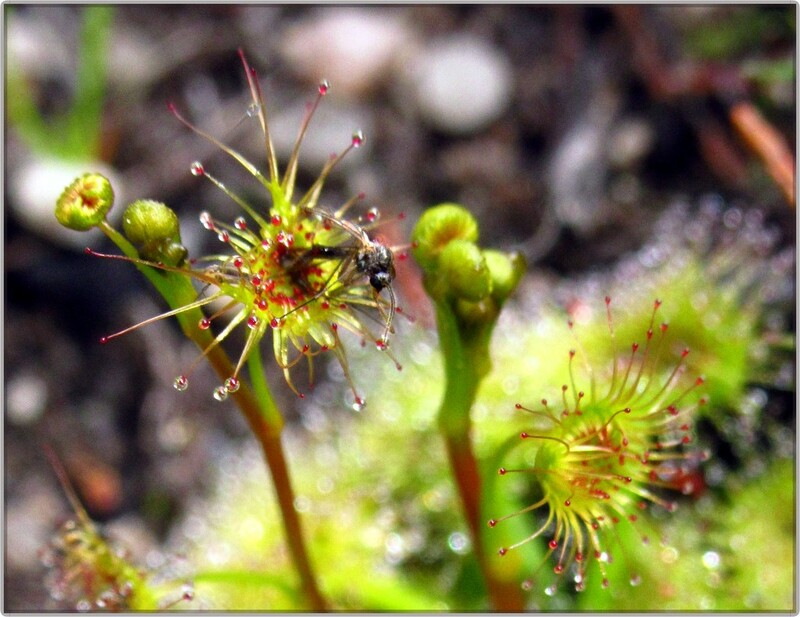 These are strange little SunDews which form tall stalks and have sundews all the way up them. Good for catching fly-by's I guess. @olivetreeann Hi Ann. This fellow would probably like to be a bee - he might be strong enough to escape then. He's actually a mosquito and if you look closely you can see that his front feet and his back end are stuck onto the little droplets of the SunDew. He'll be gradually digested and absorbed by the plant. Sort of funny that they are so cute but have such horrific digestive habits. :) Thanks again for having a look. @robz Didn't look close enough to notice the misquito trying to escape the sticky inside of the plant. Ooops! Cool and excellent shots. Love these plants. Used to have them in a terrarium at one time. Exciting plants. So much lovely color in this pic. An amazing mosquito capture! And against some intriguing background flowers too. @stimuloog Sorry Marloes - forgot your tag in the earlier reply! Thanks for having a look! You came up with a great DoF here. You also got really cool bokeh.